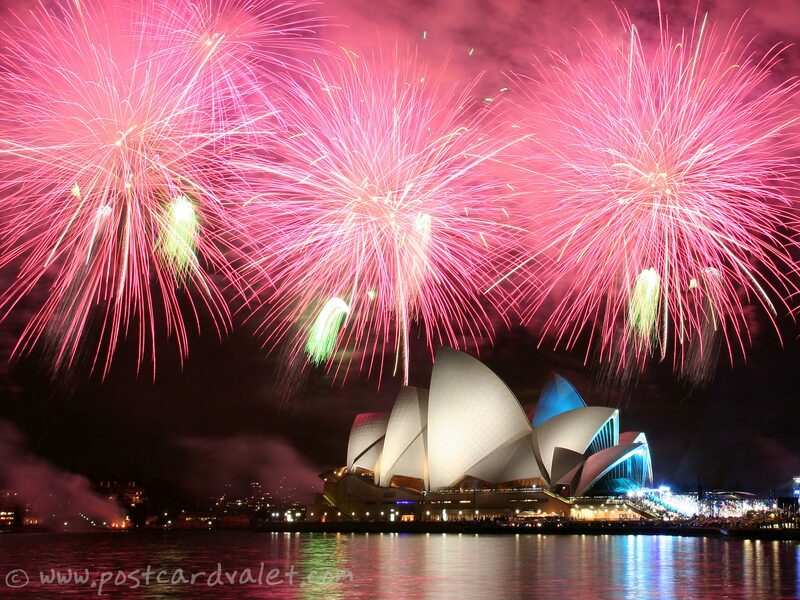 To celebrate the finale of Australian Idol in 2007, Sydney hosted a fireworks display over the Sydney Opera House. Much of the story of how we came to see it is presented in Postcard Valet episode 8, but we never mentioned there how we took our photographs in it. So we set up two cameras – one for video, one for stills. The video camera was perched on a tiny tripod atop a piling. The best we could do with our DSLR was to balance it a little lower down on a railing. Unfortunately, there was a short stairway down to the water in front of us and other bystanders kept standing right in front of it. 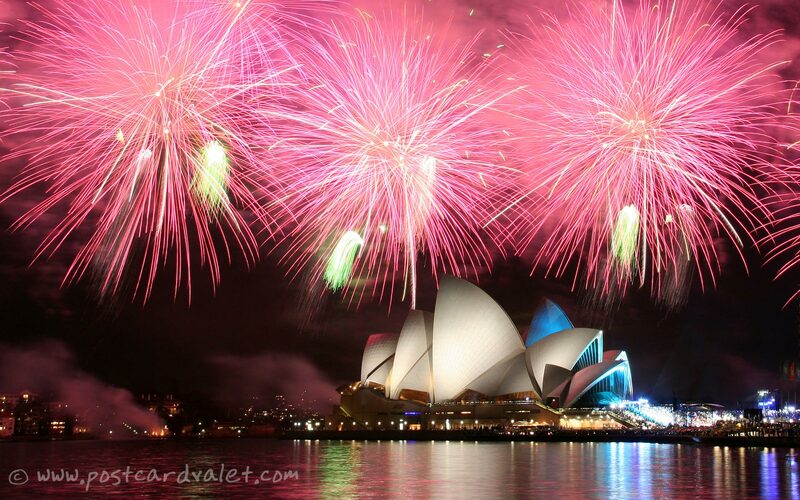 We had the Opera House framed pretty well, but we had no idea how high up the fireworks would be so we just waited. And waited. You can see in the podcast that when the fireworks finally went off, they were higher than we thought they’d be. The camera was already set on manual with long exposures, so while I recomposed the shot with the video camera, Oksana simply tilted our still camera back and began taking successive 8 second exposures. We had 10 files on the flash card by the end of the show, so I guess that means it was somewhere around 90 seconds long. Seemed longer. Some of those photos are overexposed, especially toward the end when they wrapped up the pyrotechnics display with a huge finale. Others have too much smoke hanging in the air. While this one might not be the very best of the bunch, it’s my favorite. Photoshop: Cropped and slightly rotated. Sydney Opera House is one of the coolest buildings I’ve ever seen!This picture brings back very nice memories of our trip to Australia!